Monday November 6th 1922 Mrs Dow started home this morning. I finished pillow cases. Had letter from Laura Mason. Wrote Lizzie L & Mary Holson. Tuesday November 7th 1922 Busy all forenoon. We all went with Ott to vote. I then went up to Roy Weldies and later called at Rev Ellis. I came home in taxi. Spent evening working on things for the store. Wednesday November 8th 1922 Was sewing in AM. Rode to town with Ott. Walked out to John McCallisters & later to see Gertrude Smith. Home with Ott. Wrote Laura. 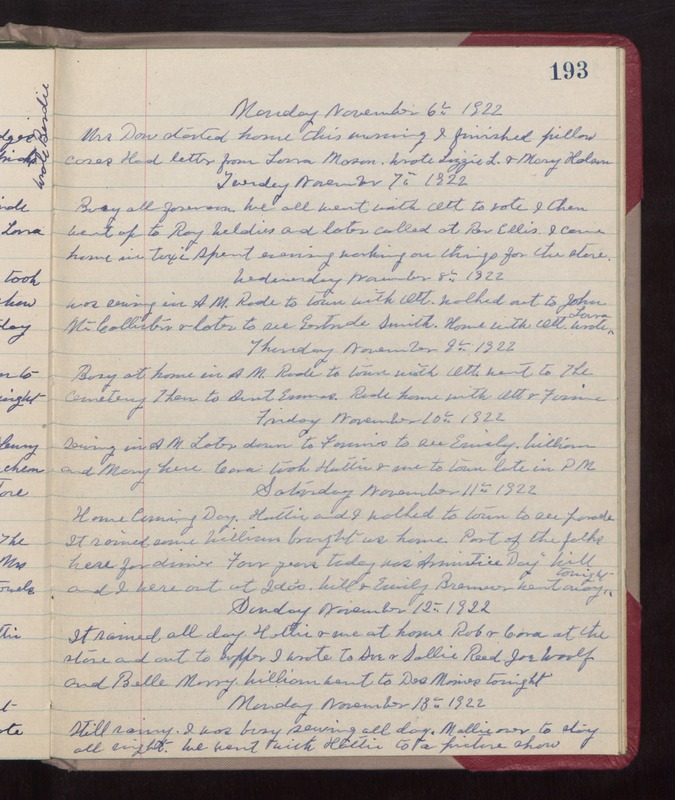 Thursday November 9th 1922 Busy at home in AM. Rode to town with Ott. Went to The Cemetery. Then to Aunt Emmas. Rode home with Ott & Fannie. Friday November 10th 1922 Sewing in AM. Later down to Fannies to see Emily. William and Mary here. Cora took Hattie & me to town late in PM. Saturday November 11th 1922 Homecoming Day. Hattie and I walked to town to see parade. It rained some. William brought us home. Part of the folks here for dinner. Four years today was "Armistice Day" Will and I were out at Idas. Will & Emily Bremner went away tonight. Sunday November 12th 1922 It rained all day. Hattie & me at home. Rob & Cora at the store and out to supper. I wrote to Sue & Sallie Reed, Joe Woolf, and Belle Murry. William went to Des Moines tonight. Monday November 13th 1922 Still rainy. I was busy sewing all day. Mollie over to stay all night. We went with Hattie to a picture show.